Only a super genius whiz will be able to solve all 60 challenges to zap through the mazes and strike the tokens with the laser. 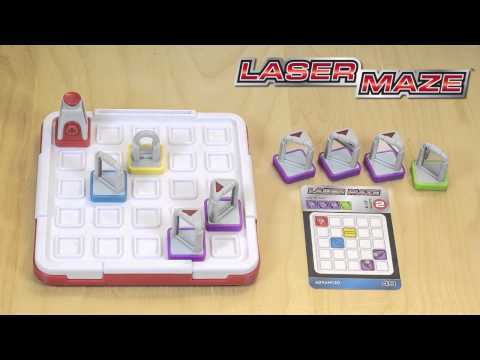 From beginner, to intermediate, to advanced, to the terrifying expert level, you'll try to arrange the mirrored tokens to reflect and split the laser beams to make it to the finish line. Simply select a challenge card and arrange the tokens on the included grid to match the challenge. You'll have to figure out how to add the extra tokens to beat the challenge! Hours of fun can be had measuring the power of lights and mirrors, and satisfying the logical corner of your brain that's always trying to solve a puzzle. Size: 10.75" x 2.5" x 9.5"